Fear of the unknown often holds organizations back from building an inclusive workforce. According to a recent report by the Institute of Corporate Productivity, preconceived concerns about hiring workers with intellectual disabilities averaged 42% higher than challenges actually experienced employing them. 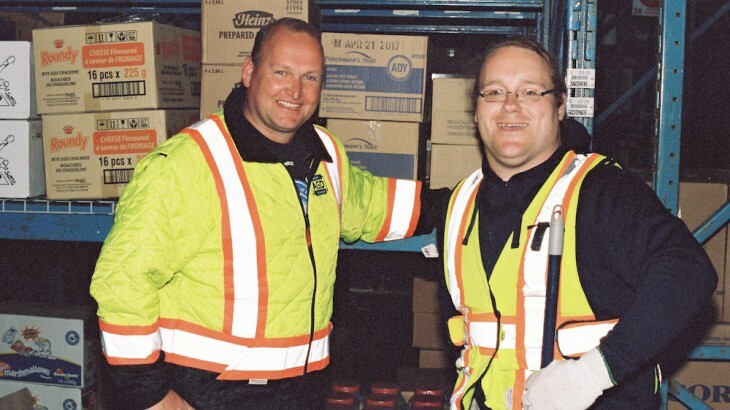 At Atlantic Grocery Distributors Ltd. (AGD) in Bay Roberts, Newfoundland, this concern was top of mind for Supervisor, Bill Hunt, when he hired Tim to work as a janitor in the warehouse. Tim was hired through Ready, Willing and Able (RWA), a national initiative designed to increase the labour market participation of people with intellectual disabilities and Autism Spectrum Disorder (ASD). A key goal is to address many of the preconceived barriers that employers anticipate when it comes to hiring an individual with an intellectual disability or ASD. This often includes safety concerns, productivity and the effect on team performance and corporate culture. As the one of the main employers in the Conception Bay North region of Newfoundland, AGD has embraced the idea of inclusive employment and initially started hiring part-time employees for various positions. When a full-time janitorial position was required, they decided to hire through RWA. “As a food distributor, we have strict safety and cleanliness standards that have to be met, so this is a very important job,” says Hunt, “Tim is an extraordinary employee—he takes direction without complaint, is always on time and gets along well with his co-workers. In fact, Tim’s work ethic and high level of productivity have led to additional responsibilities, including assisting with food deliveries to local customers. Research shows that high-performance organizations like AGD are 37% more likely to hire people with intellectual disabilities because they see the talent and skill matching potential. RWA helps employers match the right candidate to the right job and provides support every step of the way. Funded by the Government of Canada and active in 20 communities across the country, RWA is a national partnership of the Canadian Association for Community Living (CACL), the Canadian Autism Spectrum Disorders Alliance (CASDA) and their member organizations.